You know the classic Suncom’s Totally Accurate Controller MK2, right? Better known simply as the TAC-2. The favourite Atari-standard joystick of countless people, with the reputation of being indestructible. Other than durable, it’s also a very good game controller. The design is simple, you can hold it in your hand very comfortably, no matter if you’re left or right-handed. And the feel and tactile response is top-notch. 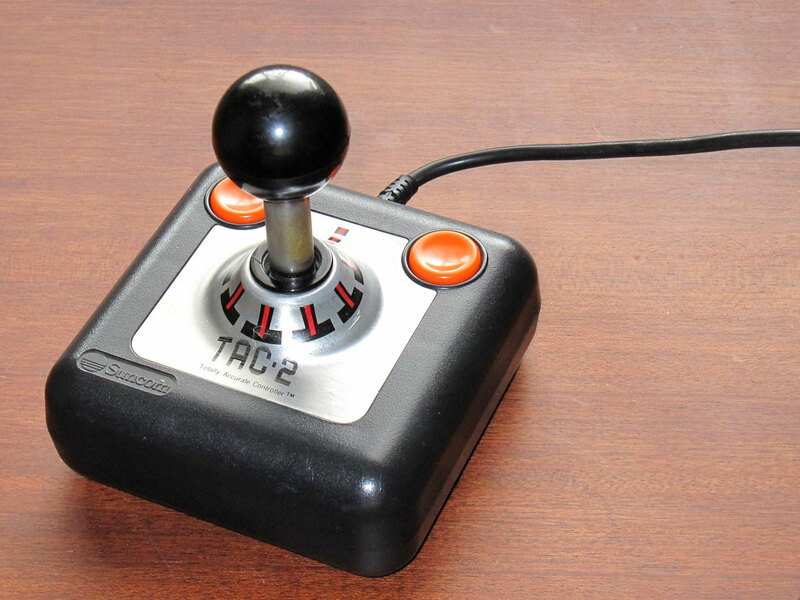 While not completely fail-proof, at least TAC-2 withstood abuse much better than most other joysticks that were commonly used with Commodore 8-bits, Amigas and Atari computers. Both the durability and usability are result of very, very simple yet functional design. I mean, have you ever looked inside of that controller? It appears that there isn’t anything that could ever fail. 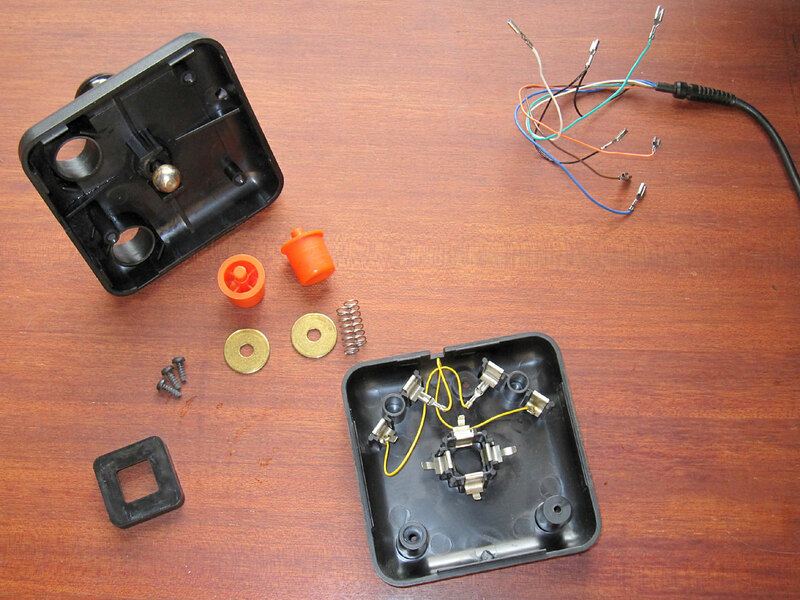 Here’s a picture of TAC-2 dismantled. You can completely take the stick apart and put it back together without using any other tools than a screwdriver, which is needed for the three screws that hold the case together. The buttons and directional switches are nothing but robust construction where metal part presses against another when you press a button or the stick into some direction. In its simplicity it’s ingenious. But in fact there are some common issues with TAC-2. The buttons tend to become unresponsive over time. As with any switch, metal oxidation is the main reason. Or plain dirt. Eventually this may happen with the directional stick too. But in fact, you could try to rub the contact surfaces clean to make better contact without even opening up the controller. Just wiggle the stick around or rotate the button with your thumb while pressing it. You know you used to do that! When this instinctive maintenance method didn’t work anymore, you probably had to open the controller. A common trick was to flip the metal washers of the buttons around, so you had a fresh metal surface to act as the button switch contact. Another seemingly common thing was to clean the contact surfaces with sand paper (I’ve repaired few TAC-2s over the years and seen this thing done by others). While this works at first, I’m not sure if it’s such a good idea. Preferably use some corrosion removing and protecting spray and something less rough to rub the surface clean. That should help better against re-oxidation. 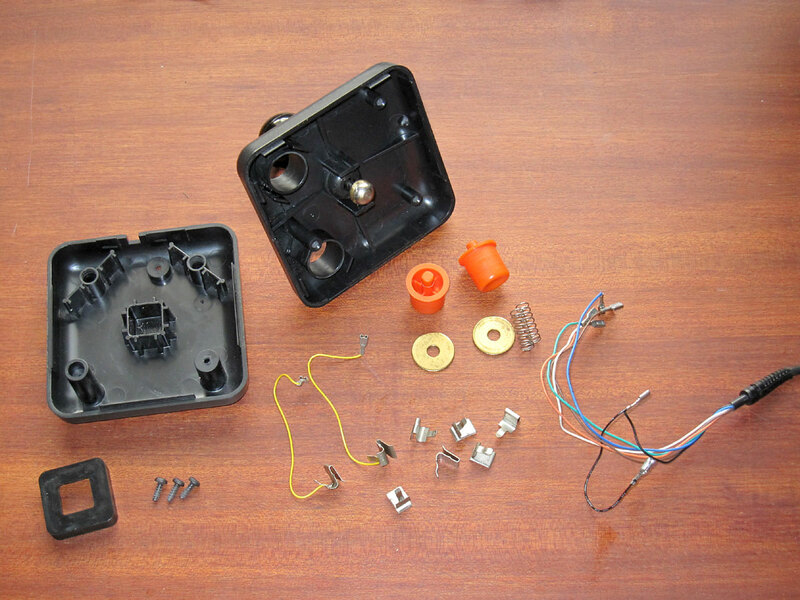 Another thing that may happen with TAC-2 is that the internal wiring does not make a proper contact anymore. 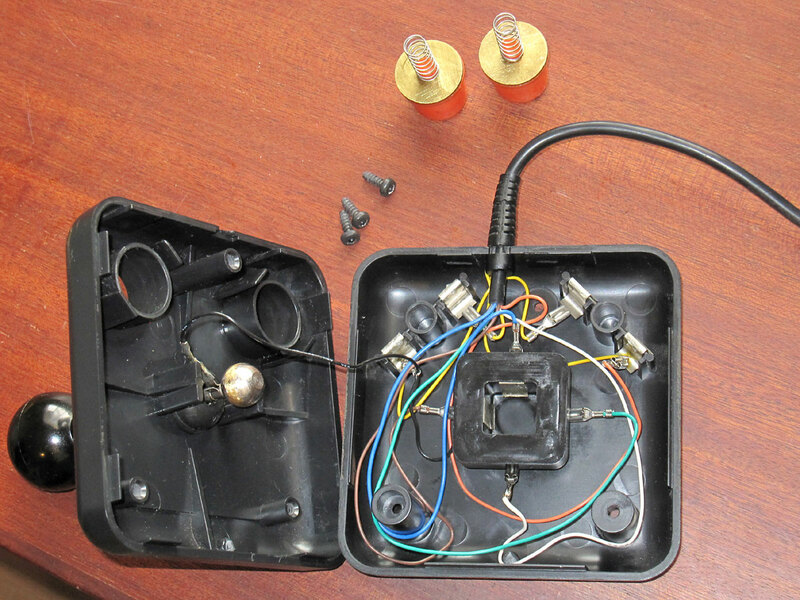 The wires are not soldered into the “switches” but use simple wiring connectors. Also these may oxidize or even become loose. Pressing them back and forth or applying some corrosion removing spray usually does the job. For a loose connector use nose pliers. Another thing you can’t prevent by good design is wiring or cable degradation. Movement and shocks translates into small mechanical stress to the wires that run inside the cable or controller, and eventually, one of the lines may simply break. This is exactly what had happened to one TAC-2 I had. 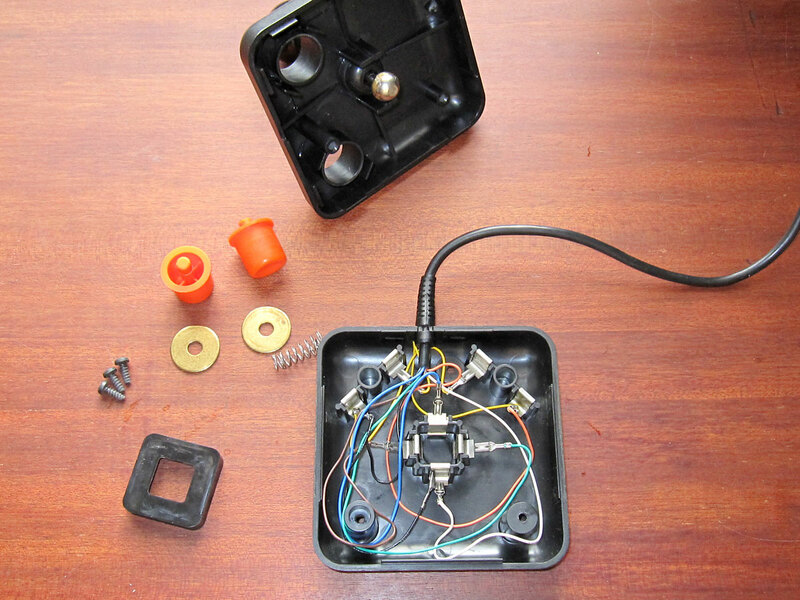 The joystick was completely dead, so it had to be a broken ground line (the stick does not make any readable connections without the ground contact). The broken spot was near the connector so I simply cut the cable behind the broken spot and soldered an off-the shelf D9 female connector in place. It’s not pretty, and it doesn’t sit in the controller port as tightly as the original connector, but at least it works. The metal clips that are used as the switch contacts are all identical. Two of them have wires soldered onto them for cross-wiring the buttons. By the way, the wires are colour coded: White for up, blue for down, orange for button and so on. Apparently it used to be an unofficial standard for joystick makers of the time. I applied light vaseline for the contact surfaces. It should help both wear and corrosion of the contacts. TAC-2 in its full glory! Now this stick should operate reliably for another twenty plus years! 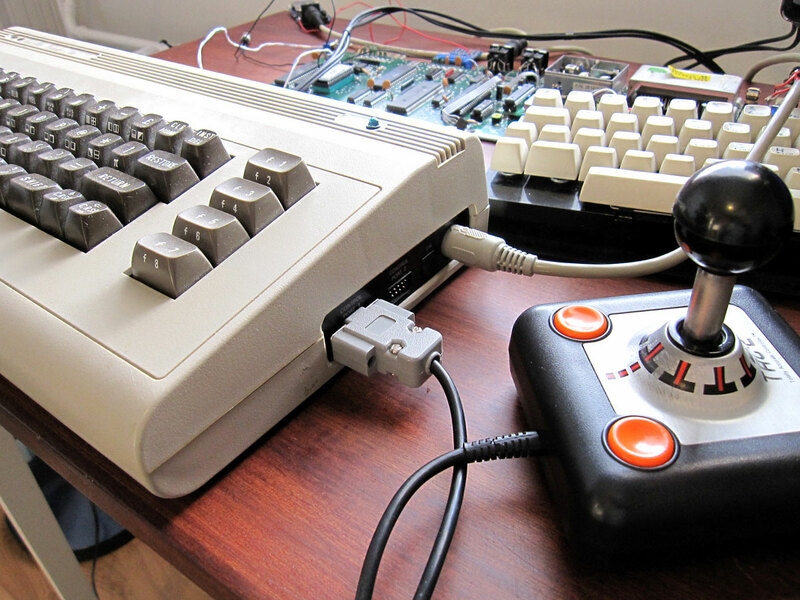 This entry was posted on Saturday, February 4th, 2012 at 17:12 and is filed under C64 Hardware, Other Retro Hardware. You can follow any responses to this entry through the RSS 2.0 feed. You can leave a response, or trackback from your own site. TAC-2 is my all-time favourite joystick. I’m currently looking to buy one, but they are not easy to find. These joysticks are the best for old-school shoot’em ups in my opinion. Yeah, TAC-2 is wonderful. It used to be also my favourite stick until I found Suzo’s “The Arcade”. It’s based on micro switches and feels very accurate. Hmm.. Suzo’s “The Arcade”.. is that the one with a fire-button on top of the stick and one in front? There are different variants of the stick, and yes, that’s one of them. I’ve only ever used the one with only one button at the center of the base. I have 6 or 7 TAC-2 and they are quite different inside. For instance, one version uses a form of rubber gasket to provide flexibility for the stick, and it’s gone really hard and dry over the years. Also, button design is radically different. If you like, I can take them apart and send you photos. I bought one of this TAC-2 joysticks some weeks ago. Never had one of it in the 80’s or 90’s so it’s my first one and i must say, i like it. Feels worthy built and is nearly undestroyable with normal playing. One thing in found out – while the four normal directions (up/down/left/right) worked good from the beginning on with my TAC-2 and i only need a little press to steer in these, the corners don’t work as good. Here i must push harder that it works correctly and i don’t liked that. So i opened the TAC-2, first cleaned all the contacts (two firebuttons and the four directions) with fine sandpaper, then with Isopropanol and at least put contact-spray on them. Put the stick together again and tried it and now the corners respond better, but still not good enough for me. Then i opened the stick again, put out those four metal-contact-plates from these black plastic-square and bend them slightly apart to have a shorter steering-way until the stick reacts. Next i take a small little plate of sheet and put it between any of the metal-contact-plates and the black plastic where the metal-contact-plates are pinned to. This causes, that they are a little bit more inwards and that the ball which is on the end of the joystick-gear will reach them sooner. One of the really cool features of the TAC-2 is that the stick is actually made out of a TR-418 tire valve!